(Newser) – James Holmes is a "patently dangerous homicidal man" who should never have been able to buy thousands of rounds of ammunition, tear gas, and body armor, argues a suit filed yesterday against four companies that supplied the accused Aurora, Colo., movie theater shooter with those items. 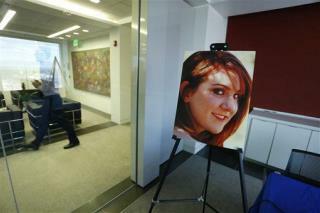 The suit was filed by the parents of Jessica Ghawi, who was 24 when she was killed in the attack. It argues that "the defendants did not make reasonable inquiries into Holmes' purchases, nor did the defendants take any extra precautions when selling Holmes weapons, accessories, and ammunition, or ask Holmes why he wanted the items." It paints the companies as "negligently and unlawfully" supplying him with those items. just a damn nut who should have been locked up but was not! rip but this is a money grab! Well if this isn't a frivolous money grab then I don't know what is. They should sue the person actually responsible for the crime, but I guess he doesn't have any money for them. Greedy trash. Lawyers aren't inherintaly bad. But the local news only shows extreme cases won. If we only had some modecom of news.